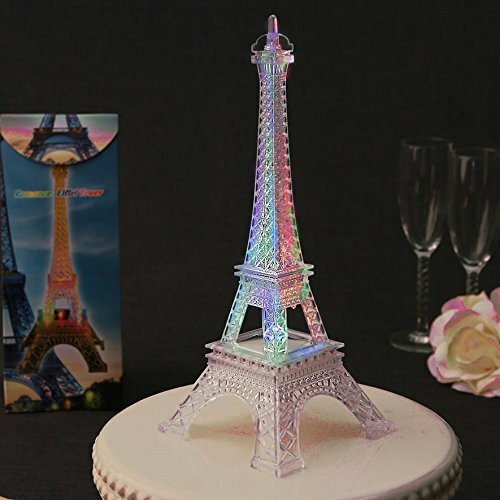 This replica of the iconic Eiffel Tower is highly detailed, and measures 10" high x 4" square at the base. Battery operated, it has LED lights that constantly change color and intermittently flash. The on-off switch is at the base of the Eiffel Tower. When "off" it's simply a clear replica. Batteries are included and are replaceable. Beautifully boxed in a full color box. Be reminded of Paris every day. Made of lightweight plastic, and highly detailed architecturally. An ideal centerpiece for your next French themed party! Perfect as a centerpiece for your next French themed party! Beistle S54128MCAZ3, 6 Piece 3-D Congrats Grad Photo Centerpieces, 6" x 7.75"